If you find articles here helpful but need additional information, you're welcome to contact me. I'm not as actively involved in podcasting circles as I once was. There is a lot more useful information available now than when I started this resource, but some of the information is not so good. Audio can be complicated, but it can be mastered. Audio does not have to be intimidating. One of the most often asked and most difficult questions for podcasters is, “How can I take live telephone calls on my show?” People have resorted to all sorts of techniques to bring live telephone callers on the air, including connecting a cell phone to the mixer using a TRRS cable and even holding a phone’s speaker up to a microphone. Neither solution is particularly robust. You may be pleasantly surprised to learn that there is an excellent service that provides features only available in professional broadcasting equipment that can cost thousands of dollars. You can have a call screener located anywhere in the world who selects callers to be placed on the air. All the host has to do is click a button to go live with the caller. Hardware requirements are minimal. You need a fast computer and a mix minus from your mixer. Take a look. Skype is a half-duplex audio service, which means that only one person can talk at a time. Think of an old fashioned speaker phone or even a walkie talkie or Nextel. Most of the time, that's not a problem. However, there are some advanced uses of Skype in which the half-duplex clipping, or ducking, is a problem. Here is an updated and simplified version of an article I wrote a couple of years ago on how to eliminate Skype Ducking. This version uses only Skype. The big "gotcha" with this configuration is that you must have excellent Internet bandwidth on both the caller's and the host's sides. An article I wrote about microphones appears on Page 38 of the May/June 2014 edition of Radio Guide magazine, a trade magazine primarily for terrestrial broadcasters. You might find it interesting. Here's a guest appearance I did on the IAIB Spotlight with Andrew Zarian, warts and all. You might find some useful information here. If you use Skype to bring in audio from a co-host or a regular guest, are you having problems with Skype "ducking" the audio during the call? That is, when the guest and the host talk at the same time, is the lower volume audio suppresed in favor of the louder one? The reason you have the issue is Skype is a half-duplex communications system. Only one person can talk at a time. While Skype does a great job of balancing the callers, if you as the host try to play music over Skype for your guest, such as theme music, the ducking problem will become blatantly obvious. There is a quick solution. Take a look at this article on the IAIB (and become a member.) If you have any questions or comments, you can reach me on Twitter (@mcphillips) or in the Podcasting Technology Resources Community in Google+ Communities. This is really handy if you're recording interviews for your show. If you use Facebook and you want to interact with other Internet Broadcasters, join the "Internet Broadcasters" group. It's closed, but requests to join are processed promptly. Tell us what you're doing, or ask for help. Phantom Power and Bias Voltage: Is There A Difference? Phantom power and microphone bias voltage are not the same. This brief article explains the difference between the two. At the risk of soundling like a broken record, here is another review of the ATR2100-USB dynamic microphone. It's perfect for most podcasters. Unfortunately, its price is creeping up. They're now almost $52 at amazon.com, and they're much higher elsewhere. Apparently AT has realized they've got a good thing here. Many small-diameter microphones are 3/4" diameter including the EV RE10/15/16/18 series, the EV 635A, the AKG D112, the Neumann KM184, and hundreds more. The older EV mics came with a model 310 stand adapter, which was discontinued in favor of the model 311 that allows snapping the mic into place. While I always prefer to have the original adapter that was shipped with a mic, sometimes they are lost or broken and are not available. The EV 311 is about $14US from Full Compass. The Audix DCLIP is about $10US shipped from Sweetwater Sound. Just for fun, I ordered an Audix DCLIP to see first hand how robust this clip is. It's a good one. The swivel locking mechanism works very well in that the thumb screw tights a surface with gripping teeth against a fiber washer to prevent slipping. It's easy and quick to position the mic. It will be interesting to see how well the clip holds up. Fiber washers don't last forever, although a suitable replacement part may be available at a hardware store. Even then, while the clip is only $10, if you buy a lot of them, it can get expensive replacing them for the sake of a washer. Sweetwater didn't have the EV 311 on their website, so I was not able to order one to compare. Full Compass carries them, but they are not eligible for free shipping, making it more practical to add them to an order down the road. The 3/4" mic is also a 19mm mic. Many mic clips are specified for 19-23mm mics. Just for grins, I ordered an Audio-Technica AT8405a stand adapter for a 21mm mic. A difference of 2mm really matters. This AT clip does not fit a single mic I own. If you really need to use your iPhone as an audio recorder for remote podcasting, take a look at this website. Spend some time clicking on the links and watching the videos. Be aware that the input characteristics of the iPhone 3 and iPhone 4 are different. If you get the wrong adapter, you will NOT be happy with the results. It's all explained here. The author of this article listened to some of the best radio microphones in the world and picked the best two podcasting microphones on the market. Includes audio clips. Decide for yourself which mics are worth their price. The Ultimate Podcast Microphone Shootout was the most helpful resource I found for selecting my own choice. Congrats Dan. Is your show live? 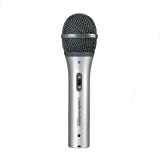 The very popular ATR2100 microphone has a body diameter that is larger than most handheld microphones. Accordingly, it's often challenging to find a shock mount to isolate it from table noise and vibrations. I recently discovered a shock mount that fits the ATR2100 (and the AT2005USB and Samson Q2U) perfectly. It's the Sterling Audio SM5. The regular price is $30. It's a quality piece of equipment, and it comes with a spare set of bands. I bought one from Musician's Friend, but a lot of dealers carry them. By design, they do not hold the mic rigidly. That's how they provide isolation. So, be careful with it, and it should provide years of good service. Do you get a lot of “snap, crackle, and pop” with your audio connections? Do you hear disgusting noises when you touch or rotate an audio plug that is connected to your mixer? If so, you probably have oxidized connectors! Do yourself a favor and order a can of Caig Laboratories’ Deoxit D5 contact conditioner. Amazon has it in stock, it’s eligible for Prime. It’s not cheap, but it lasts a long time. The price of the ATR2100 has been all over the place in the last couple of years. For now, it's back down to $39.99. November 9, 2015: Unfortunately it's at $52.00 at the moment. Keep watching Amazon for sales. It was $36 a couple of weeks ago, but they did not have many in stock. February 26, 2018: The price is now around $64.00. While that's the highest I've seen it, the microphone is still a great value. The next step up is a Heil PR40, which is $325.00. If you're having problems interfacing your Skype computer with your mixer, take a look at this article at the IAIB. If you have any questions, my contact information is at the end of the article. If you use a mixer to create a mix-minus feed to include Skype guests with your Internet broadcast or podcast, make sure you understand the difference between pre-fader and post-fader auxiliary sends. Not every mixer gives you the opportunity to designate whether an aux send is pre-fader or post-fader. Failure to differentiate between the two can cause a lot of headaches. If you're buying a mixer, read the specifications clearly before you make your final decision. For example, the Presonus StudioLive 16.4.2 has a button on each aux send that makes it pre or post. The Presonus StudioLive 16.0.2 requires that you change the aux send in the System settings in the firmware. (The default is pre-fader.) The Behringer 1204 mixer has one pre and one post aux send. The Behrringer X1204 (notice the "X") has one switchable pre/post aux send and one fixed post aux send. That's why I always recommend the X1204 over the 1204 even though it is a little more expensive. Most Internet broadcasters will want post-fader sends. While pre-fader sends can be useful for some applications, those applications are very specific. You really have to know what you're doing to use them effectively. Behringer, Mackie, Alesis, Yamaha, and Presonus mixers are designed for live sound reinforcement and music recording. We adapt them to use as broadcasting and podcasting mixers. If you understand what goes on under the hood, you will have a better chance of making these mixers work the way you want. If you have any questions, or if I can help, follow me on Twitter at @mcphillips. I own a Mackie ProFX12 and the Behringer 1204USB. This information provided better insight on Mix Minus. Thanks! This was good. question- are aux sends the way to also use the same mixer and computer (with multiple sound cards) to both do production work or live voicing on the same equiptment? IE: an aux for skype...and aux for live voicing, and one for producing spots, commercials, voice overs, voice tracks etc - so it doesn't go over the air? Yes, but I recommend the M-Audio Audiophile 1010LT PCI sound card. It has four usuable stereo channels (five, including SPDIF) that allow you to use one computer four channels. The main audio requires a channel as does each mix-minus. If your mixer has a USB output, you have five usable channels. If you need more information, contact me on Twitter - @mcphillips. There are several types of plugs typically used by Internet broadcasters and podcasters to connect their computers, MP3 players, and microphones to their mixers and recorders. Two of the most popular connectors are the 1/8” mini plug and the 1/4” phone plug. People often confuse these plugs, so they are discussed in this article I posted on the IAIB blog. A great write up. Covers all the major points. Here's a review of the Heil Pro Set 3 professional stere headphones on the IAIB website. Here is an excellent technical paper written by Bill Whitlock of Jensen Transformers. Click on the image at the link above to download a PDF copy of "Understanding, Finding, & Eliminating Ground Loops in Audio & Video Systems." If you're not familiar with Jensen transformers, they are among the highest quality audio transformers in the world. If you are listening to audio from your computer, radio, or TV at the moment, you're probably hearing through one or more Jensen transformers. This post will only briefly touch on the complex subject of ground loops. The short story is that when you connect a mixer to a computer to a sound system, there is an excellent chance that you will get a ground loop. A ground loop manifests itself as a high pitched whine superimposed on your audio. They can be hard to diagnose, but they can be simple to solve. Contrary to what you may think, the whine is not coming from the computer or the mixer; it is created by interconnecting them. The device at the link is from Radio Shack and is called a ground loop isolator. It's really nothing more than a pair of audio transformers. What's good about these units is that, unlike a lot of Radio Shack merchandise, they are good quality. Transformers can be very expensive, as in a hundred dollars or more per channel. It's amazing how good these are for about $18US. Assuming you're using a mixer, the simplest way to diagnose a ground loop is to monitor the sound with headphones while you can clearly hear the whine. Start unplugging the audio connections to the computers and amplifiers until the whine disappears. In brief, if you disconnect the audio to and from your computer and the whine goes away, you need a ground loop isolator between your mixer and your computer. In this case, if you're recording and playing computer audio in stereo, you'll need two of these Radio Shack units. The reason you have to have two units is that the ground loop is created when the GROUND of the mixer is connected to the GROUND of the computer. Since the ground on the input is the same as the ground on the output, connecting either one will cause the problem. Unfortunately, you're going to have to do some trial and error. The Radio Shack ground loop isolators are in stock in most stores. However, if you have some time and want to save some money, check out this eBay seller: http://goo.gl/KECVH The isolators are surplus, are sticky, and have to be cleaned with lighter fluid, but they work great for podcasting. If you're having a ground loop problem, you can contact me by email at podcasting at mikephillips.me. I'll try to help you solve your problem. All I ask in return is that you follow me on Twitter (@mcphillips) and that you tell others about this site. There's a simple free solution to ground loops, which may not be possible depending on your physical location and power setup: plug all devices that connect with your audio system into the same power circuit. When devices share the same ground, you generally won't get that audible buzzing sound. The Audio-Technica AT8410a microphone shock mount is one of the best I've found. Almost any mic less than 30 mm will fit in it. (It will not work for the ATR2100-USB.) The isolation provided by the elastic bands is excellent. Street price is $48US. Mine have lasted more than 20 years. EDITED TO ADD: One of my 8410a shock mounts turned out to be an early model for which replacement bands are no longer available. AT offered to swap it for a new one for $29. The offer seemed like a good deal at the time. However, by the time I paid shipping on the old unit ($5), paid for the replacement ($29), and paid for return freight ($9.50), I had $43.50 plus a trip to FedEx invested. In retrospect, it would have been easier to throw the old one away and buy a new one for $48. Nevertheless, this shock mount is my absolute favorite. I may be one step closer in my quest to locate the perfect podcast mixer. Quite by accident I discovered the Allen & Heath XB-14. You can click on the link to read all of the specifications, but several features are worth mentioning. There are two mix-minus channels built in (they're labeled Telco). For a podcaster, those channels are probably used for Skype 1 and Skype 2 (or Google Voice, Paltalk, TalkShoe, or a SIP client). There are four stereo input channels, but the fourth one is a USB return for your computer audio. Most mixers have a USB return on a small rotary fader, and sometimes it's hard to get the USB audio back into the mix. Since the mixer was designed for live broadcast, there is control room speaker muting on the mic channel as well as some other logic switching options. There are mutliple headphone feeds so the host can have a separate feed from the guests. Amazon has the XB-14 for about $950US, which is the lowest price I've found. I've never touch one of these mixers, so my observations are based on reading the specifications. Do your homework before you spend your money. So, you ask, why doesn't Behringer or Allen & Heath make the PERFECT podcasting mixer? Unfortunately the sales would be too low to justify the product development and manufacturing. It's possible to do almost anything you want to do in podcasting with a mixer such as a Presonus StudioLive 16.4.2 or 16.0.2, a Mackie 1640i, or a Behringer X2442USB, but with those mixers, you have to understand, create, and manage your own mix-minus feeds. If I ever get the opportunity to evaluate one of these interesting units, I'll report back. If you have or have used an XB-14, please comment below or send me an email with your observations. I have my eye on this one. In fact they just released or announced the MkII update earlier this August 2013. "Turn the ATR2100-USB over, and in addition to the usual single XLR connector, you will also find a Mini-B USB port, an 1/8-inch headphone jack and a volume control dial. While it functions as any other XLR mic, the USB port allows it to connect easily, in true plug-and-play fashion, to any computer - Windows or Mac. Plug some headphones directly into the mic for instant audio monitoring, adjust the volume and wail away. And the quality? Excellent! For versatility and quality, the Audio-Technica ATR2100-USB Cardioid USB/XLR Mic is our choice for Videomaker's Best Handheld Microphone." This article first delves into the fact that this is a great microphone and that is is great for any connection becuase it has a multi pulg which makes it very much useful for many recordings. The article continues to talk about it's set-up and best uses but does not call it a universal microphone that is great for every situation. It is a very well endowed equiptment and it is obvious but it does not fill the full spectrum or recording requirements.I found this article greatly useful because it hit the questions head on without a dodge or fake answer. I think the uses of different microphones are useful.